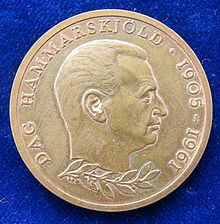 Dag Hjalmar Agne Carl Hammarskjöld (/ˈhæmərʃʊld/; Swedish: [ˈdɑːɡ ²hamːarˌɧœld] ( listen); 29 July 1905 – 18 September 1961) was a Swedish economist and diplomat who served as the second Secretary-General of the United Nations. Hammarskjöld was the youngest person to have held the post, at an age of 47 years upon his appointment. 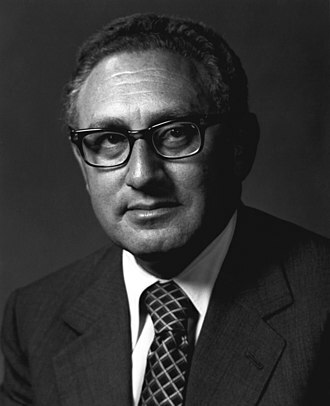 His second term was cut short when he died in the crash of his DC-6 airplane (whose cause is still disputed) while en route to cease-fire negotiations during the Congo Crisis. 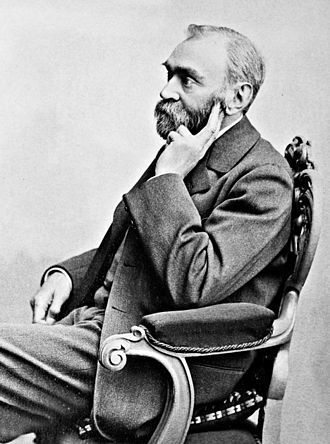 He is one of only four people to be awarded a posthumous Nobel Prize. Hammarskjöld has been referred to as one of the two best secretaries-general of the United Nations, and his appointment has been mentioned as the most notable success for the UN. United States President John F. Kennedy called Hammarskjöld "the greatest statesman of our century." 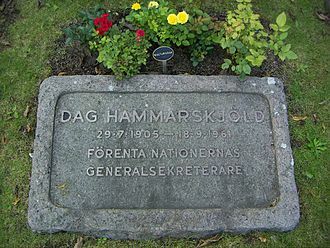 Dag Hammarskjöld was born in Jönköping to the noble family Hammarskjöld (also spelled Hammarskiöld or Hammarsköld). He spent most of his childhood in Uppsala. His home there, which he considered his childhood home, was Uppsala Castle. He was the fourth and youngest son of Hjalmar Hammarskjöld, Prime Minister of Sweden from 1914 to 1917, and wife Agnes Maria Carolina Hammarskjöld (née Almquist). Hammarskjöld's family was ennobled in 1610 due to deeds of the warrior Peder Mikaelsson (after 1610) Hammarskiöld (approximately 1560 – 12 April 1646), an officer in the cavalry who fought for both sides in the War against Sigismund, where he took the name Hammarskiöld at his ennobling. Hammarskjöld's ancestors had served the Monarchy of Sweden since the 17th century. Hammarskjöld studied first at Katedralskolan and then at Uppsala University. By 1930, he had obtained Licentiate of Philosophy and Master of Laws degrees. Before he finished his law degree he had already obtained a job as Assistant Secretary of the Unemployment Committee. From 1930 to 1934, Hammarskjöld was Secretary of a governmental committee on unemployment. 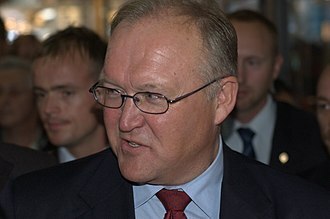 During this time he wrote his economics thesis, "Konjunkturspridningen" ("The Spread of the Business Cycle"), and received a doctorate from Stockholm University. In 1936, he became a secretary in Sweden's central bank the Riksbank. From 1941 to 1948, he served as chairman of the Riksbank's General Council. Hammarskjöld quickly developed a successful career as a Swedish public servant. He was state secretary in the Ministry of Finance 1936–1945, Swedish delegate to the Organization for European Economic Cooperation 1947–1953, cabinet secretary for the Ministry of Foreign Affairs 1949–1951 and minister without portfolio in Tage Erlander's government 1951–1953. 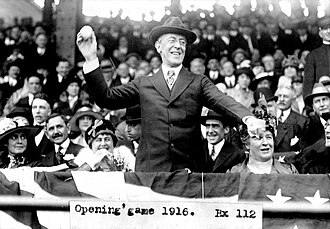 He helped coordinate government plans to alleviate the economic problems of the post-World War II period and was a delegate to the Paris conference that established the Marshall Plan. In 1950, he became head of the Swedish delegation to UNISCAN, a forum to promote economic cooperation between the United Kingdom and the Scandinavian countries. 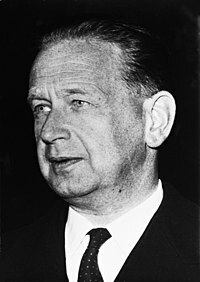 Although Hammarskjöld served in a cabinet dominated by the Social Democrats, he never officially joined any political party. In 1951, Hammarskjöld was vice chairman of the Swedish delegation to the United Nations General Assembly in Paris. He became the chairman of the Swedish delegation to the General Assembly in New York in 1952. 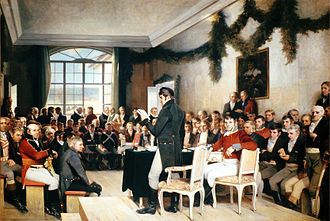 On 20 December 1954, he was elected to take his father's vacated seat in the Swedish Academy. On 10 November 1952 Trygve Lie announced his resignation as Secretary-General of the United Nations. 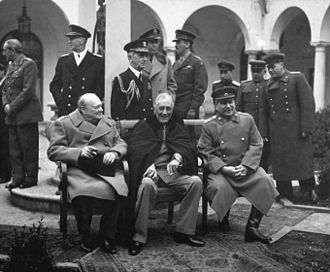 Several months of negotiations ensued between the Western powers and the Soviet Union, without reaching an agreement on his successor. 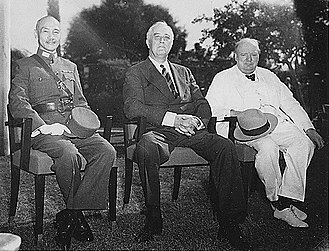 On 13 and 19 March 1953, the Security Council voted on four candidates. Lester B. Pearson of Canada was the only candidate to receive the required majority, but he was vetoed by the Soviet Union. At a consultation of the permanent members on 30 March 1953, French ambassador Henri Hoppenot suggested four candidates, including Hammarskjöld, whom he had met at the Organisation for European Economic Cooperation. The superpowers hoped to seat a Secretary-General who would focus on administrative issues and refrain from participating in political discussion. Hammarskjöld's reputation at the time was, in the words of biographer Emery Kelèn, "that of a brilliant economist, an unobtrusive technician, and an aristro-bureaucrat". As a result, there was little to no controversy in his selection; the Soviet permanent representative, Valerian Zorin, found Hammarskjöld "harmless". Zorin declared that he would be voting for Hammarskjöld, surprising the Western powers. The announcement set off a flurry of diplomatic activity. British Foreign Secretary Anthony Eden was strongly in favor of Hammarskjöld and asked the United States to "take any appropriate action to induce the [Nationalist] Chinese to abstain." (Sweden recognized the People's Republic of China and faced a potential veto from the Republic of China.) At the U.S. State Department, the nomination "came as a complete surprise to everyone here and we started scrambling around to find out who Mr. Hammarskjold was and what his qualifications were." The State Department authorized Henry Cabot Lodge Jr., the US Ambassador, to vote in favor after he told them that Hammarskjöld "may be as good as we can get." 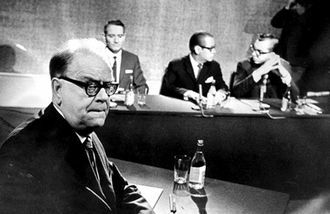 Later in the day Hammarskjöld held a press conference at the Swedish Foreign Ministry. 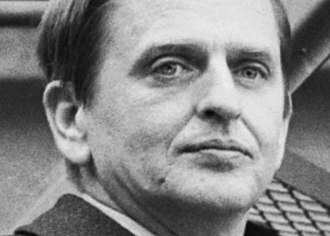 According to diplomat Sverker Åström, he displayed an intense interest and knowledge in the affairs of the UN, which he had never shown any indication of before. Immediately following the assumption of the Secretariat, Hammarskjöld attempted to establish a good rapport with his staff. He made a point in going to every UN department to shake hands with as many workers as possible, eating in the cafeteria as often as possible, and relinquishing the Secretary-General's private elevator for general use. He began his term by establishing his own secretariat of 4,000 administrators and setting up regulations that defined their responsibilities. He was also actively engaged in smaller projects relating to the UN working environment. For example, he planned and supervised every detail in the creation of a "meditation room" at the UN headquarters. This is a place dedicated to silence, where people can withdraw into themselves, regardless of their faith, creed, or religion. During his term, Hammarskjöld tried to smooth relations between Israel and the Arab states. Other highlights include a 1955 visit to China to negotiate the release of 11 captured US pilots who had served in the Korean War, the 1956 establishment of the United Nations Emergency Force, and his intervention in the 1956 Suez Crisis. 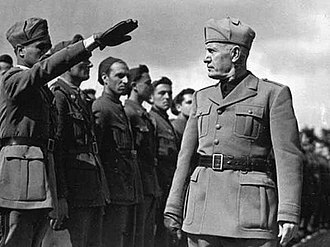 He is given credit by some historians for allowing participation of the Holy See within the United Nations that year. In 1960, the former Belgian Congo and then newly independent Congo asked for UN aid in defusing the Congo Crisis. Hammarskjöld made four trips to Congo, but his efforts toward the decolonisation of Africa were considered insufficient by the Soviet Union; in September 1960, the Soviet government denounced his decision to send a UN emergency force to keep the peace. 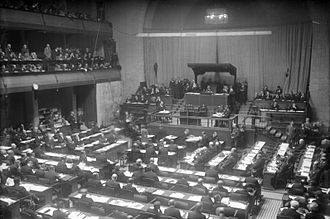 They demanded his resignation and the replacement of the office of Secretary-General by a three-man directorate with a built-in veto, the "troika." The objective was, citing the memoirs of Soviet leader Nikita Khrushchev, to "equally represent interests of three groups of countries: capitalist, socialist and recently independent." In September 1961, Hammarskjöld learned about fighting between UN forces and Moise Tshombe's Katangese troops. Hammarskjöld was en route to negotiate a cease-fire on 18 September when his Douglas DC-6 airliner SE-BDY crashed with no survivors near Ndola, Northern Rhodesia (now Zambia). Hammarskjöld and 15 others perished in the crash, the circumstances of which are still unclear. There is some evidence that suggests the plane was shot down. Hammarskjöld's death set off a succession crisis at the United Nations, as there was no line of succession and the Security Council had to vote on a successor. Göran Björkdahl (a Swedish aid worker) wrote in 2011 that he believed Hammarskjöld's death was a murder committed, in part, to benefit mining companies like Union Minière, after Hammarskjöld had made the UN intervene in the Katanga crisis. Björkdahl based his assertion on interviews with witnesses of the plane crash, near the border of the DRC with Zambia, and on archival documents. Former U.S. President Harry Truman commented that Hammarskjöld "was on the point of getting something done when they killed him. Notice that I said 'when they killed him'." On 16 March 2015, United Nations Secretary-General Ban Ki-moon appointed members to an Independent Panel of Experts which would examine new information related to Hammarskjöld's death. The three-member panel, led by Mohamed Chande Othman, the Chief Justice of Tanzania, also included Kerryn Macaulay (Australia's representative to ICAO) and Henrik Larsen (a ballistics expert from the Danish National Police). The panel's 99-page report, released 6 July 2015, assigned "moderate" value to nine new eyewitness accounts and transcripts of radio transmissions. 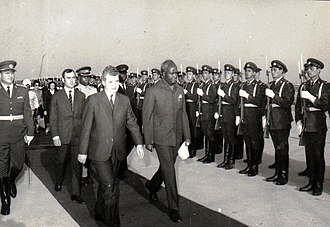 Those accounts suggested that Hammarskjöld's plane was already on fire as it landed, and that other jet aircraft and intelligence agents were nearby. Over the years, multiple claims have been made that the plane was shot down, and that Hammarskjöld was actually killed in an assassination plot involving some combination of the CIA, MI6, a Belgian mining company, a South African paramilitary unit, because he was pushing for the Congo's independence, which would have hurt the interests of any of those forces. Documents suggesting CIA involvement came to light when the South African National Intelligence Agency turned over a file to the South African Truth and Reconciliation Commission related to the 1993 assassination of Chris Hani, the leader of the South African Communist Party. These documents included an alleged plot to "remove" Hammarskjöld and contained a supposed statement from CIA director Allen Dulles that: "Dag is becoming troublesome … and should be removed." 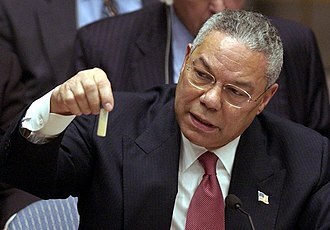 However the authenticity of these documents has not been established. In 2019 the documentary film Cold Case Hammarskjöld alleged that a Belgian pilot, Jan Van Risseghem, has been named as a possible attacker. Van Risseghem had extensive ties to Britain, including a British mother and wife, trained with the RAF and was decorated by Britain for his service in the Second World War. The Film-makers investigating the 1961 crash found a friend of Van Risseghem who claimed the pilot confessed to shooting down the UN plane. But the explanation of how man should live a life of active social service in full harmony with himself as a member of the community of spirit, I found in the writings of those great medieval mystics [Meister Eckhart and Jan van Ruysbroek] for whom 'self-surrender' had been the way to self-realization, and who in 'singleness of mind' and 'inwardness' had found strength to say yes to every demand which the needs of their neighbours made them face, and to say yes also to every fate life had in store for them when they followed the call of duty as they understood it. The foreword is written by W. H. Auden, a friend of Hammarskjöld's. The Evangelical Lutheran Church in America commemorates the life of Hammarskjöld as a renewer of society, on the anniversary of his death, 18 September. Honorary degrees: Carleton University in Ottawa (then called Carleton College) awarded its first-ever honorary degree to Hammarskjöld in 1954, when it presented him with a Legum Doctor, honoris causa. The University has continued this tradition by conferring an honorary doctorate upon every subsequent Secretary-General of the United Nations. 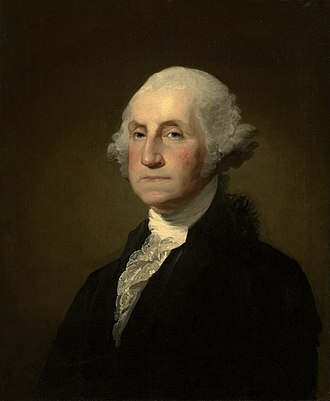 He also held honorary degrees from Oxford University, United Kingdom; in the United States from Harvard, Yale, Princeton, Columbia, the University of Pennsylvania, Amherst, Johns Hopkins, the University of California, and Ohio University; in Sweden, Uppsala University; and in Canada from McGill University as well as Carleton University, in Ottawa. John F. Kennedy: After Hammarskjöld's death, U.S. president John F. Kennedy regretted that he had opposed the UN policy in the Congo and said: "I realise now that in comparison to him, I am a small man. He was the greatest statesman of our century." In 2011, The Financial Times wrote that Hammarskjöld has remained the benchmark against which later UN Secretaries-General have been judged. Historian Paul Kennedy hailed Hammarskjöld in his book, The Parliament of Man, as perhaps the greatest UN Secretary-General because of his ability to shape events, in contrast with his successors. In contrast, the conservative popular historian Paul Johnson, in A History of the Modern World from 1917 to the 1980s (1983), was highly critical of Hammarskjöld's judgment. 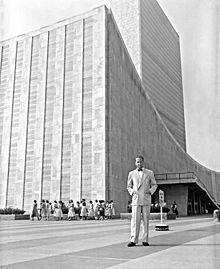 The Dag Hammarskjöld Library, a part of the United Nations headquarters, was dedicated on 16 November 1961 in honour of the late Secretary-General. Uppsala University Library: There is also a Dag Hammarskjöld Law Library at his alma mater, Uppsala University. Columbia University: The School of International and Public Affairs at Columbia University has a Dag Hammarskjöld Lounge. The graduate school is dedicated to the principles of international peace and cooperation that Hammarskjöld embodied. Stanford University: Dag Hammarskjöld House, on the Stanford University campus, is a residence cooperative for undergraduate and graduate students with international backgrounds and interests at Stanford. The Geneva School of Diplomacy and International Relations in Geneva, Switzerland, has a room named after him. Dag Hammarskjöld Stadium is the main football stadium of Ndola, Zambia. Hammarskjöld's flight crashed in the outskirts of Ndola. 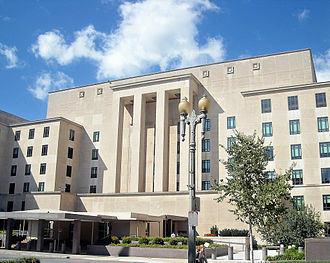 Dag Hammarskjöld College: founded in Columbia, Maryland, in 1972, educated international students from 1972–1974. The concept that international relations are relationships between individuals, and that the better we understand each other, the better chance there is for world peace, was the centerpiece for this college. The college admitted students from both undergraduate and postgraduate levels while they lived in an international community. The headquarters of the United Nations Economic Commission for Latin America and the Caribbean (CEPAL) in Santiago, Chile, lies on Avenida Dag Hammarskjöld. Hammarskjöldplatz is the wide square to the north entrance of the Messe Berlin fairgrounds in Berlin, Germany. There is a public square in Haedo, Buenos Aires, Argentina named after him. Schools: Several schools have been named after Hammarskjöld, including Hammarskjold Middle School in East Brunswick Township, New Jersey; Dag Hammarskjold Middle School in Wallingford, Connecticut; Dag Hammarskjold Elementary School in Parma, Ohio; Dag Hammarskjold Elementary (PS 254) in Brooklyn, New York; Dag Hammarskjold School#6 in Rochester, New York; Dag Hammarskjold Elementary School in Oakland (now an airport parking business) and Hammarskjold High School in Thunder Bay, Ontario. Religious commemoration: He is also commemorated as a peacemaker in the Calendar of Saints of the Evangelical Lutheran Church in America on 18 September of each year. Dag Hammarskjöld Foundation: In 1962, the Dag Hammarskjöld Foundation was created as Sweden's national memorial to Dag Hammarskjöld. Medal: On 22 July 1997, the U.N. Security Council in resolution 1121(1997) established the Dag Hammarskjöld Medal in recognition and commemoration of those who have lost their lives as a result of UN peacekeeping operations. Hammarskjöld himself was one of the first three recipients. Prize in Peace and Conflict Studies: Colgate University annually awards a student the Dag Hammarskjöld Prize in Peace and Conflict Studies based on outstanding work in the program. Postage Stamps: Many countries issued postage stamps commemorating Hammarskjöld. 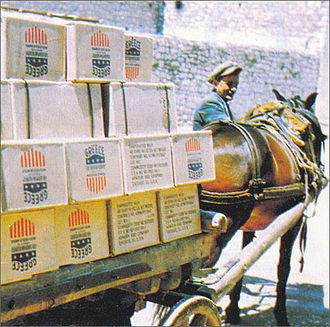 The United Nations Postal Administration issued 5- and 15-cent stamps in 1962. They show the UN flag at half-mast and bear the simple inscription, "XVIII IX MCMLXI". The United States Hammarskjöld commemorative 4-cent postage stamp, issued on 23 October 1962, was actually released twice. Famous for its misprint, the second issue is often referred to as the Dag Hammarskjöld invert. ^ "Hammarskjöld". Collins English Dictionary. ^ "Next U.N. secretary general - The Japan Times". This article names Kofi Annan as the other one. ^ "How Not to Select the Best UN Secretary-General". 28 October 2015. ^ a b Linnér S (2007). "Dag Hammarskjöld and the Congo crisis, 1960–61" (PDF). Uppsala University. p. 28. Archived from the original (PDF) on 5 April 2012. ^ a b Sze, Szeming (December 1986). Working for the United Nations: 1948–1968 (Digital ed.). Pittsburgh: University of Pittsburgh. p. 20. Retrieved 7 November 2014. ^ a b "Biography, at Dag Hammerskjoldse". 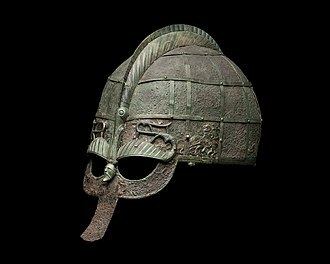 Daghammarskjold.se. Archived from the original on 2 October 2013. Retrieved 2013-09-10. ^ "Dag Hammarskjöld" [biography]. United Nations. un.org. Retrieved 2017-10-13. ^ a b Lipsey 2013, p. 117. ^ Heller 2001, p. 14. ^ FRUS 1952–1954 III, Document 213: Memorandum of Telephone Conversation, by the Deputy Director of the Office of United Nations Political and Security Affairs (Popper), March 31, 1953. ^ FRUS 1952–1954 III, Document 216: Memorandum of Conversation, by the Deputy Assistant Secretary of State for United Nations Affairs (Sandifer), April 30, 1953. ^ FRUS 1952–1954 III, Document 211: The United States Representative at the United Nations (Lodge) to the Department of State, March 30, 1953—1:38 p.m.
^ FRUS 1952–1954 III, Document 212: Memorandum for the Files by the Assistant Secretary of State for United Nations Affairs (Hickerson), March 30, 1953. ^ a b c Heller 2001, p. 15. ^ a b Lipsey 2013, pp. 117–118. ^ a b c Lipsey 2013, p. 118. ^ Heller 2001, p. 21. ^ Lipsey 2013, p. 135. ^ Mary Cherif; Nathalie Leroy; Anna Banchieri; Armando Da Silva. "The Meditation Room in the UN Headquarters". UN.org. Retrieved 2013-09-10. ^ "Holy See's Presence in the International Organizations". Vatican.va. 22 April 2002. Archived from the original on 2014-02-15. Retrieved 2013-09-10. ^ Borger, Julian (17 August 2011). "Dag Hammarskjöld: evidence suggests UN chief's plane was shot down". The Guardian. Retrieved 2014-08-02. ^ Borger, Julian (4 April 2014). "Dag Hammarskjöld's plane may have been shot down, ambassador warned". The Guardian. Retrieved 2014-08-02. ^ Halberstam, David (19 September 1961). "Hammarskjold Dies In African Air Crash; Kennedy Going To U. N. In Succession Crisis". The New York Times. ^ Bjorkdahl, Goran (17 August 2011). "Dag Hammarskjöld: I have no doubt Dag Hammarskjold's plane was brought down". The Guardian. Retrieved 2014-08-02. ^ Jamie Doward, "Spy messages could finally solve mystery of UN chief’s death crash", The Guardian 13 December 2014. ^ "UN announces members of panel probing new information on Dag Hammarskjöld death". UN News Centre. 16 March 2015. Retrieved 18 March 2015. ^ Associated Press (6 July 2015). "Panel: Possible Aerial Attack on Hammarskjold Plane in 1961". The New York Times. The New York Times. Retrieved 6 July 2015. ^ a b "U.N. to Probe Whether Iconic Secretary-General Was Assassinated". Retrieved 17 December 2017. ^ "RAF veteran 'admitted 1961 killing of UN secretary general". The Guardian. Retrieved 13 January 2019. 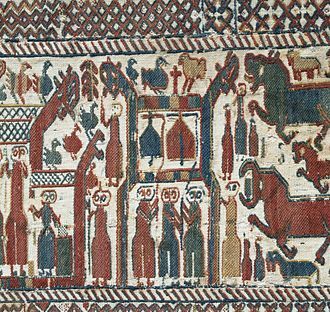 ^ "L179 The Dag Hammarskjöld Collection". National Library of Sweden. Retrieved 16 June 2018. ^ Lipsey 2013, p. 124. ^ Hartman, Thom (3 March 2005). Markings - the spiritual diary of Dag Hammarskjöld. BuzzFlash. ^ Mary Cherif; Nathalie Leroy; Anna Banchieri; Armando Da Silva. "Dag Hammarskjöld: The Un Years". UN.org. Retrieved 2011-09-19. ^ Alec Russell (13 May 2011). "The road to redemption". The Financial Times. Retrieved 2011-05-14. ^ "Hammarskjold House | About". Stanford.edu. Archived from the original on 8 August 2011. Retrieved 19 September 2011. ^ "Event Area North" (PDF). Messe Berlin. Archived from the original (PDF) on 18 February 2014. Retrieved 19 September 2013. ^ "Neighborhood News". New York magazine. March 14, 2011. ^ "Convening thinkers and doers: Sweden's Dag Hammarskjold Foundation". 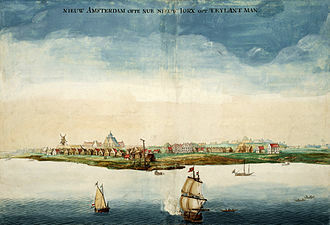 Interenvironment.org. 25 November 1975. Archived from the original on 1 October 2011. Retrieved 19 September 2011. ^ United Nations Security Council Verbatim Report 3802. S/PV/3802 22 July 1997. Retrieved 2007-08-21. ^ "Colgate University : P-CON Fellowships and Awards". Colgate.edu. Retrieved 2011-09-19. ^ Mary Cherif; Nathalie Leroy; Anna Banchieri; Armando Da Silva. "Selection of stamps commemorating the life of Dag Hammarskjöld". UN.org. Retrieved 2013-09-10. ^ "Sveriges Riksbank/Riksbanken – Sweden's new banknotes and coins". Riksbank.com. Archived from the original on 27 September 2011. Retrieved 2011-09-19. ^ "Sweden's New Bank Notes". unknown. Retrieved 2015-01-08. 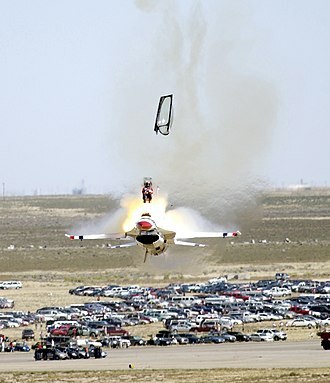 If the aircraft is destroyed or severely damaged so that it must be written off, it is further defined as a hull loss accident. 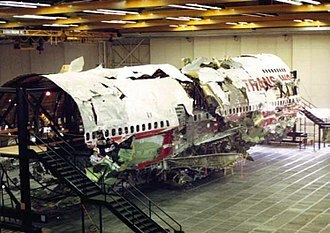 Annex 13 further defines an aviation incident as an occurrence, other than an accident,583, The Tenerife airport disaster, which occurred on March 27,1977, remains the accident with the highest number of airliner passenger fatalities. 583 people died when a KLM Boeing 747 attempted to take off without clearance, there were no survivors from the KLM aircraft,61 of the 396 passengers and crew on the Pan Am aircraft survived. Pilot error was the cause, as the KLM captain began his takeoff run without obtaining air traffic control clearance. A contributing factor was the dense fog, the KLM flight crew could not see the Pan Am aircraft on the runway until immediately before the collision. 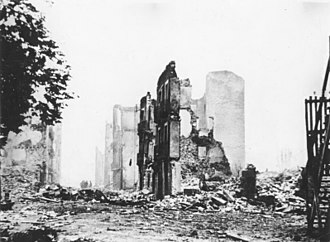 The accident had a influence on the industry, particularly in the area of communication. An increased emphasis was placed on using standardized phraseology in air traffic control communication by controllers and pilots alike. Furthermore, all members of the crew are now able to question the captains judgment concerning the safety of the airliner. 520, The crash of Japan Airlines Flight 123 on August 12,1985, is the disaster with the highest number of fatalities,520 people died on board a Boeing 747. Pilots were able to keep the plane flying for 32 minutes after the mechanical failure before crashing into a mountain, all 15 crew members and 505 of the 509 passengers on board died. 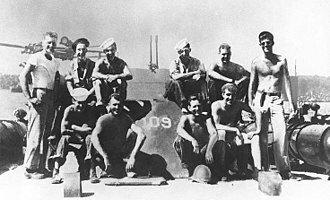 The death toll was exacerbated by delays in the rescue operation, although a number of people survived the impact, by the time the Japanese rescue teams arrived at the crash site all but four had succumbed to their injuries. 349, On November 12,1996, the worlds deadliest mid-air collision was the Charkhi Dadri mid-air collision involving Saudia Flight 763 and Kazakhstan Airlines Flight 1907 over Charkhi Dadri, the collision was mainly the result of the Kazakh pilot flying lower than the assigned clearance altitude. All 349 passengers and crew on both aircraft died. Katedralskolan is a school in Uppsala, Sweden. The school was established in 1246 and it is the oldest educational institution in Uppsala, and one of the oldest in Sweden. 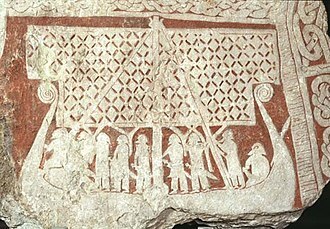 A school administered by the Cathedral existed before the year 1300, originally, in 1509, Gustaf Eriksson, who would become King Gustaf I, became a student at the school, according to Peder Svarts chronicle. 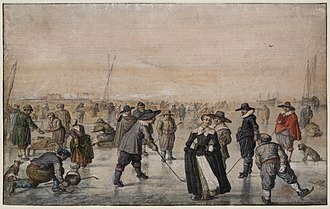 Allegedly, Eriksson tired of his studies and left the school, having driven his dagger through a book, from the late Middle Ages and up until the mid-19th century, the education was focused on the three trivial subjects, grammar and rhetoric. 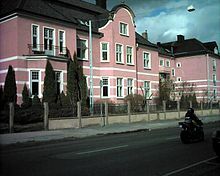 In 1865, the first student degrees were conferred on students at the school, by this time, the school was called Högre allmänna läroverket, a name it kept until 1972. In 1930, the first female students were accepted, until 1869, the school was located in various buildings next to the cathedral, but in that year it moved to its current location. Several new buildings have added to the original school building. Emerald from the Kagem Emerald Mine, Kafubu Emerald District, Ndola. Size 3.0 x 2.7 x 2.6 cm. Prime Minister Hammarskjöld on his way from the government building to the parliament in Stockholm in 1917.